If you are ever in London, the Natural History Museum (NHM) is a must see attraction. It ranks among the top natural history museums around. Schedule more than one day to see all the exhibits if you can, including their popular dinosaur exhibit that always draws large crowds. Many people have complained about the poor lighting and limited viewing space in that particular exhibit, but even with that, it is not to be missed. Accompanying the dinosaurs in the museum is an extensive online collection of fossil information, covering a wide range of dinosaurs. So given this, it should not surprise anyone that the NHM has put out a dinosaur book. The first edition of the book came out in 1993, with three more editions published since then, the latest one in 2006. We know a lot more about dinosaurs now than we did even ten years ago though, so how well does it hold up? Pretty well, for the most part, although a few Americans might be a bit perplexed by the British spelling that is occasionally different from American English. 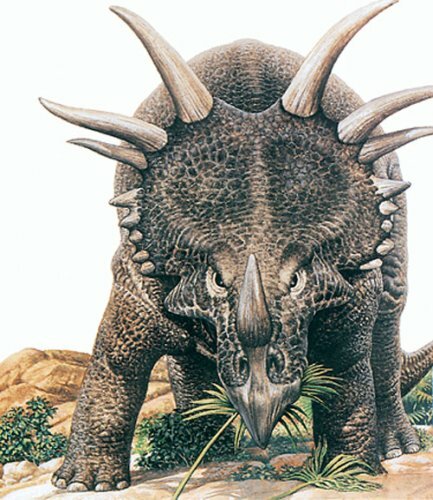 The NHM has a nice website on dinosaurs, which serves as a nice supplement to the book. 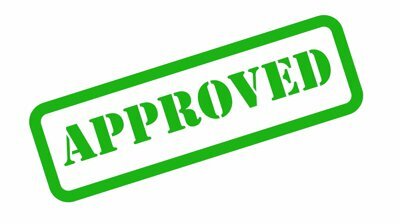 It is a long review, so if you want to skip to the summary conclusions, click here. Publication Date: 2006. 144 pg. Angela Milner has been a well respected paleontologist for decades and has been the leading researcher for dinosaurs at the NHM since the eighties, so if anyone is going to write a book about dinosaurs for the museum, it’s Dr. Milner. Tim Gardom is primarily known for this book, but he has had extensive experience writing for museum exhibits, including the dinosaur exhibit at NHM, meaning that he has practiced the art of writing technical material in a way that can be readily understood by nontechnical and diverse audiences. This book can be considered an extension of the exhibit at the museum, taking what is there and expanding upon it considerably, forming an extended guidebook. It is not a catalogue of dinosaurs, though, such as Brusatte and Benton’s Dinosaurs. 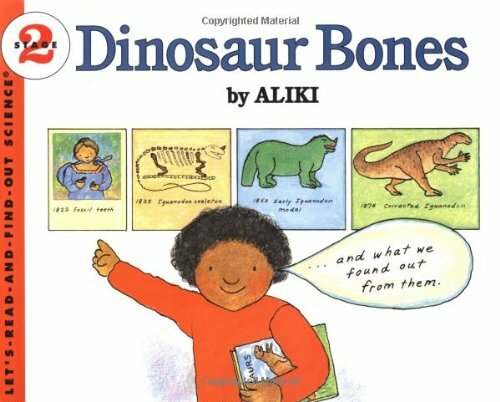 This book places dinosaurs in context within their world, focusing more on what dinosaurs were and how they lived over listing the different types, although it does that as well. More importantly, it talks about how paleontologists came to the conclusions they have, what is the evidence for what we think. While extensively illustrated with a wide array of photographs of real fossils, paintings and illustrations of reconstructed dinosaurs, and the people and places, it is not a picture book. The text is extensive, but easily readable and should be readily accessible by any interested kid of middle school age or beyond, while still being a good read for adults. The book has ten chapters broken up into an introduction to dinosaurs and the Mesozoic Era, five chapters on the lifestyles of the dinosaurs, an obligatory chapter on dinosaur extinction, a chapter on the history of dinosaur research, a chapter dealing specifically with how paleontologists piece together the clues to interpret the fossils, and finally ending with the now seemingly obligatory chapter on the evolution of dinosaurs to birds. Chapter one is noteworthy for its debunking of some popular myths about evolution in general and dinosaurs in particular. It starts immediately with dispensing with the old chestnuts of “survival of the fittest” and the idea that dinosaurs died out because they were not “fit”. They properly describe evolution as being a product of those who are more capable of surviving in a particular environment and successfully reproducing, not necessarily the biggest and strongest. They go on to discuss what types of fossils are found and how they are formed which, while in general good, neglects the important contributions of microbes to the fossilization process. But to be fair, we know much more about that now than we did then and the purely physical processes listed here are still described the same way in almost every book published today. They also do a good job describing what a dinosaur is and is not. They separate animals commonly thought to be dinosaurs, such as dimetrodons, pterosaurs, and marine reptiles, from true dinosaurs. The biggest problem with this section is that the illustrations are poor. The Tyrannosaurus would not pass muster in the first edition, much less now, and the Deinonychus is out of date. Moreover, they continue to use the term “mammal-like reptile”, rather than the more accepted term synapsid, which makes this section appear severely dated. They still use the term “thecodont” to describe the earliest archosaurs that led to dinosaurs, although they at least do say it is an informal term, not one that is formally accepted. The problem with thecodont as a term is that it throws everything with a similar jaw together, whether or not they are related. The bulk of the chapter is a good, but necessarily brief description of the Mesozoic Era, including the position of the continents, the changing climate, and the evolution of plants and animals during this time, focusing of course on the dinosaurs, but not to the exclusion of everything else, which provides the necessary context for dinosaur evolution during this time. Chapter two is all about movement and tells the story of how dinosaurs went from a lizard-like sprawl to a fully erect posture and the advantages that gave. There is discussion of some of the evidence we have for different gaits and stances, including a lot of discussion about trackways, as well as the diversity in the ways an erect stance has been utilized. 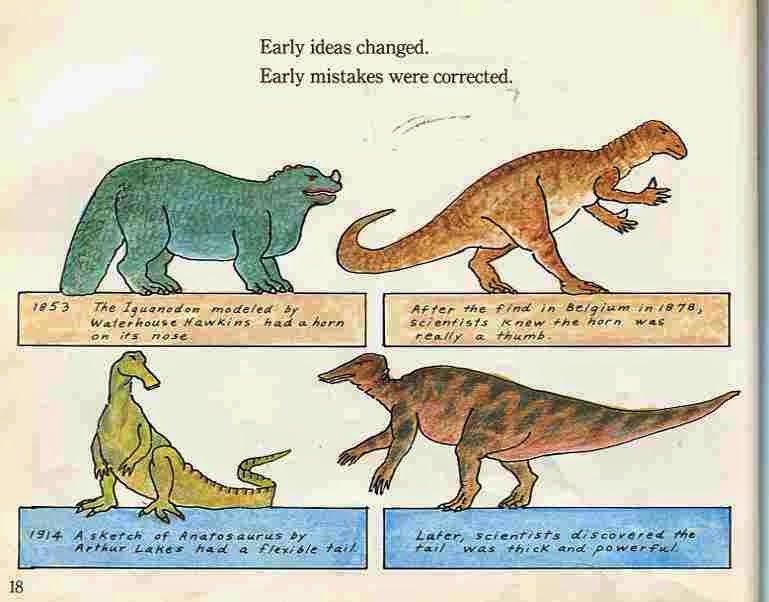 The stories of early ideas is an interesting read, although they make one serious error by saying all sauropods had their nostrils on the top of their heads, when in fact they had their noses at the end of their snouts like every other terrestrial animal. 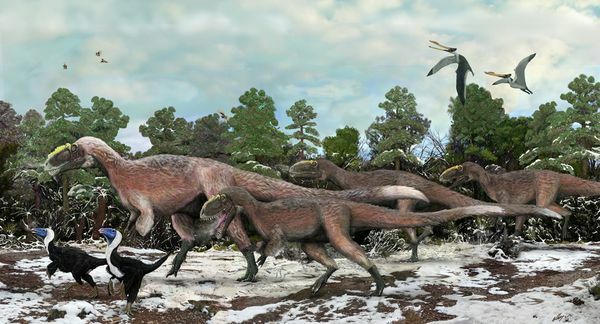 I also think they give too much time to the debate over whether or not tyrannosaurs were scavengers or hunters, even though they do eventually come down on the side of hunters, as pretty much every paleontologist does. The tyrannosaur as scavenger debate was getting a lot of press during the time of publication, but it died down pretty quickly, with no one really accepting it anymore, considering there is evidence of active hunting by tyrannosaurs. Go to the Denver Museum of Nature and Science and you will see an edmontosaur with a healed bite taken out of its back. Chapter three discusses food, how different dinosaurs ate, so one can expect several pictures of skulls and teeth. 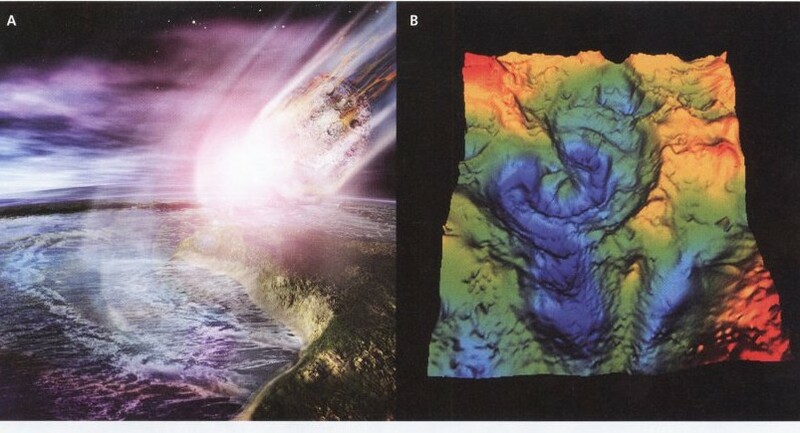 This chapter gets high marks for discussing current research at the time, such as Emily Rayfield’s work using Finite Element Analysis to determine bite force in several dinosaurs. Criticisms of the chapter include too much credence given to the idea that tyrannosaurs were scavengers which they revisit in this chapter, the discussion of neck posture in sauropods, and missing an important aspect of the tyrannosaur coprolite studies. These criticisms are mostly due to advances since the book was published, not a fault of the authors. The neck posture study has the problem of not sufficiently allowing for cartilage between the vertebrae, nor the fact that living animals bend their necks farther than allowed by that study on a regular basis. 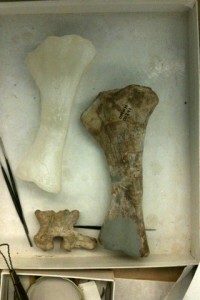 The tyrannosaur coprolite study also found remnants of muscle, which indicates a short digestion time. This is a strong indicator of an endothermic animal. Either that or an animal suffering some serious diarrhea. Finally, the chewing cycle of hadrosaurs is no longer as accepted as it was then. Casey Holliday makes a good case that the bones of the skull thought to move during chewing were really much better bound together in life, the supposed joints more an accommodation of quick growth, not for chewing (sadly, the link to the pdf of the paper in the linked article is no longer valid, but the article provides a good summary of the paper). Chapter four is attack and defense. Interestingly, this chapter discusses tyrannosaurs as hunters, ignoring the scavenger discussion of the previous chapter, providing some indication on where the authors fell in that debate. This chapter does a great job of discussing different techniques for combat and predator avoidance. High marks to this chapter for balanced discussion of current research. I particularly liked the discussion about the role of color in camouflage and display. The biggest gripe about this chapter is the presentation of theropods like Troodon as scaly when we know they were covered in feathers. It doesn’t change the discussion in the text, which is still valid and interesting, but it is a flaw in the presentation. Chapter five is about social organization, a topic not often covered well in books like this and is possibly my favorite chapter in the book. There are some interesting discussions here that will make one think about these animals as living animals within an ecological context. I would note that there is more evidence of group behavior of tyrannosaurs than was known at the time of publication, so they may have been more gregarious than thought then. 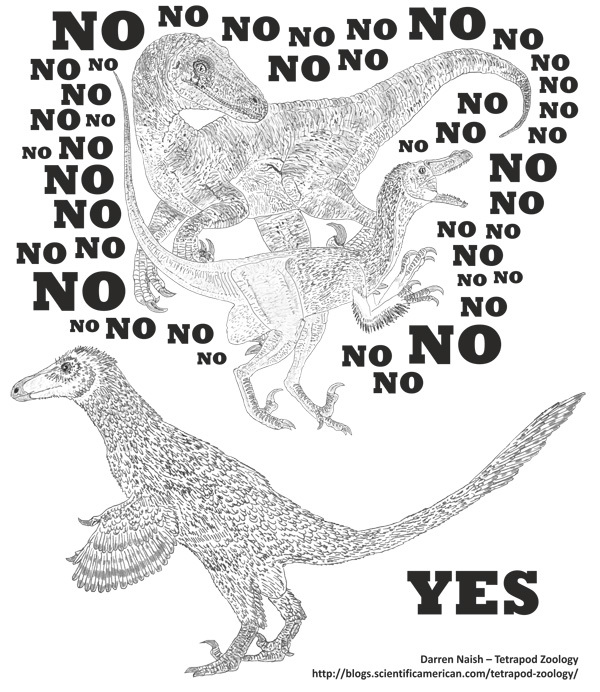 I would have liked a bit more explicit discussion of the possibility of Deinonychus as opportunistic groups rather than a cohesive pack, but the discussions do a great job of keeping facts that we know and speculation about behaviors. Chapter six is titled “Living animals”. This chapter gets into the detailed work of anatomy and molecular studies used to figure out how the animals were put together functionally and metabolically, as well as what their anatomical details tell us about behaviors. It serves as a nice introduction to the real work of paleontologists as more than just digging up fossils. It is a nice chapter and a great read. There are a few things that are a bit off, but not much. They discuss the discovery of actual soft tissue reported from a few dinosaur bones, such as proteins, blood cells, and blood vessels. They do not mention, however, that not everyone accepts those discoveries, instead concluding that what was found were more modern bacterial traces and not dinosaur soft tissue. Nevertheless, it is a good inclusion in the chapter. Our understanding of just how many dinosaurs had feathered has also grown dramatically since the book was published. Few people took the idea of a feathered, adult tyrannosaur seriously ten years ago, but we now have evidence some large tyrannosaurs were indeed feathered. They also make determining brain size in dinosaurs sound much easier than it really is because the amount of non-brain material in the cranial cavity varies substantially in animals other than mammals and birds. The evidence of color vision in dinosaurs, on the other hand, is stronger than presented in the book and we can pretty securely state that dinosaurs had not only color vision, but better color vision than we do. 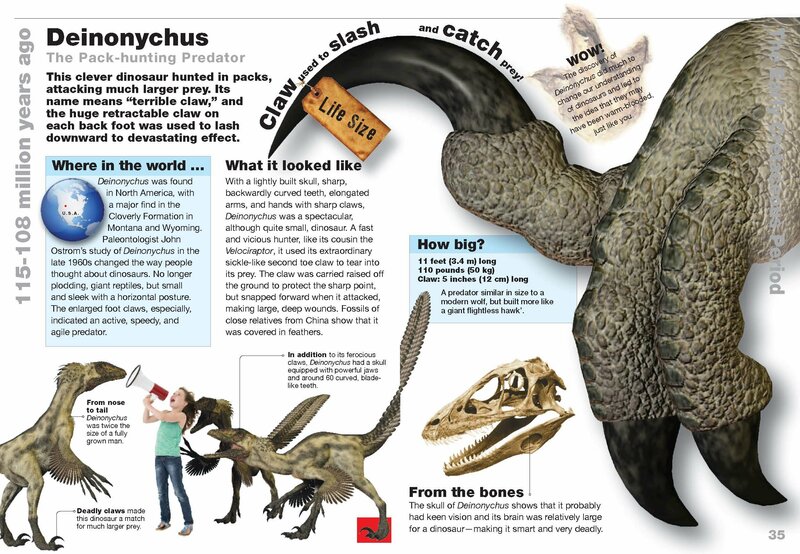 The book also uses a picture of a tyrannosaur with ridiculously large olfactory lobes that we now know is wrong. Tyrannosaurs had large olfactory lobes, indicating a good sense of smell, but they weren’t as large as presented in the book. The book devotes a decent chunk of space to the question of thermoregulation, although it is still necessarily brief, which they acknowledge, as it is a complicated discussion. For what space they have, they did a good job. I would say the idea of dinosaurs being endothermic for the most part is more accepted now than at the time of publication with new evidence pushing the debate in that direction. 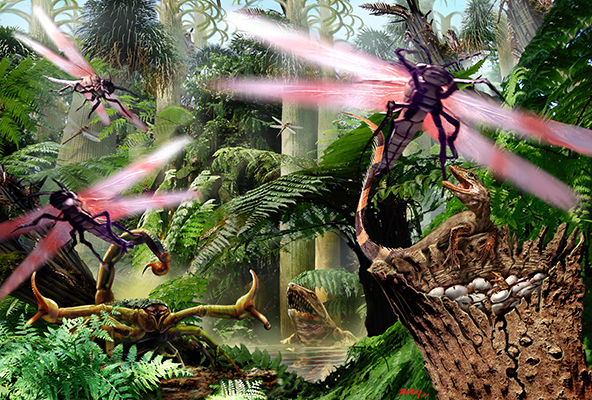 Chapter seven concerns the mass extinction at the end of the Cretaceous. It does a good job of discussing the extinction event, including what did NOT go extinct, which complicates the picture. The evidence of a massive impact has been firmly established even more so than when the book was published. The role it played and whether it was the sole cause or the giant nail in the coffin, adding to the volcanism and changing climate, is still debated. Chapter eight is called “Dinosaurs and people” and is mostly a short history of dinosaur discoveries. Chapter nine discusses what it takes to go from a discovered fossil to an understanding of the life and relationships of the animal in question. Between this chapter and chapter six, the work of paleontologists is given a good accounting and should make for a useful read for any budding paleontologist. What has been added since is a huge increase in technology which has increased data sharing, allowed people to form collaborations easier, and made modeling and experiments much easier, allowing more people to make significant contributions. 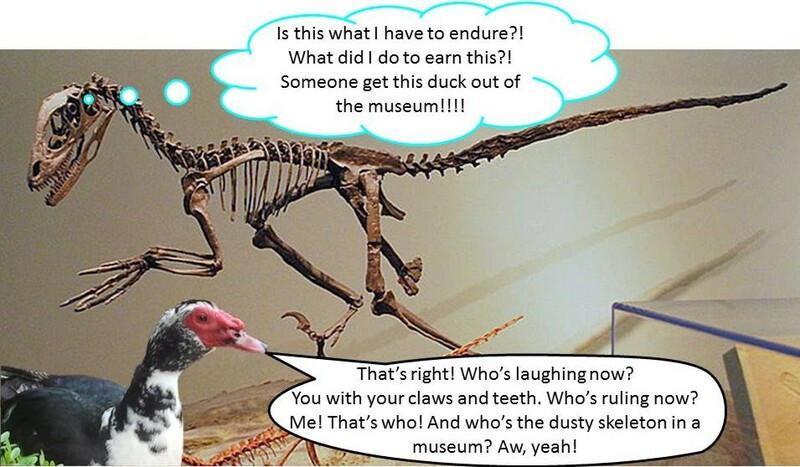 The final chapter discusses the evidence that birds are dinosaurs. The book discusses several feathered dinosaurs, but our knowledge of them and the diversity of feathered dinosaurs has grown by orders of magnitude since then. We have even found evidence of melanosomes, subcellular organelles that provide the pigment, which has allowed the determination of color in a few cases. The chapter has a good section on the origin of flight, providing the classic hypotheses, but also includes newer ideas that have greatly added to our understanding of flight, making the old hypotheses incomplete, with portions of both providing a much better answer. The book does state one thing that I would cross out. They state “It seems likely that a simple insulating cover arose first and was later modified for display, signalling, and finally flight.” This is a common belief even among paleontologists, but it is simply wrong. It is highly unlikely that feathers first arose as an insulating cover as the initial stages would have done the exact opposite of providing insulation by increasing surface area without a concurrent increase in insualtion. It is far, far more likely that feathers evolved for display purposes and were then adapted for insulation. 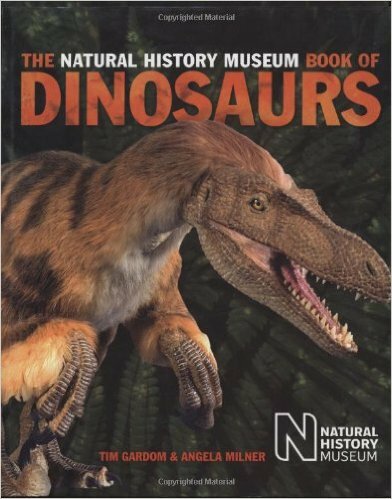 The book ends with a section providing data on several specific dinosaurs, a glossary, suggested sources for further reading, and a useful index. In summary, the book is a great read. 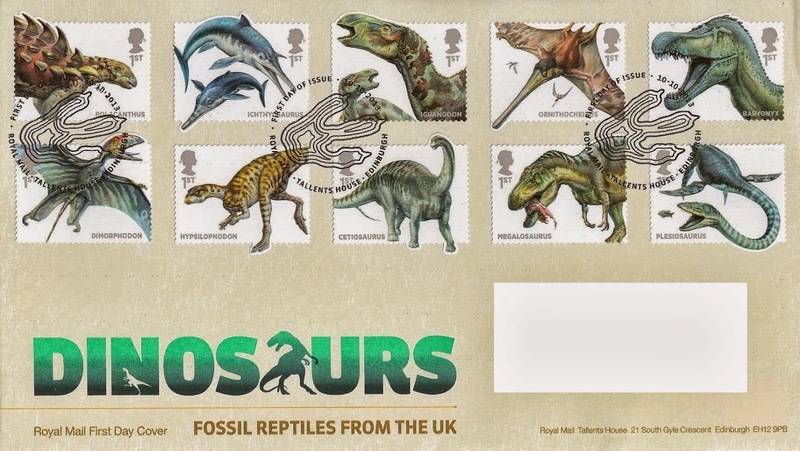 It provides an excellent look at dinosaurs as more than a stamp collection of strange creatures, but as living animals within the context of a real ecosystem. The book gives a better view of the real work of paleontologists than you will find in almost any other source. There are several places in which the science has advanced, making some specifics here and there in need of updating, but the meat of the book is still solid and provides substantial benefit to interested readers. It provides commentary in a much more thoughtful manner than is found in most other books and will make the reader think about concepts in a way rarely seen. The book shows science as a dynamic, changing field where no matter how many answers you get, there are always more questions and every piece of data requires a reexamination of the answers you already have to see if the answers are still valid. Dinosaur science is not extinct, it is still evolving and you definitely get that feeling here. This is just a quick post to point you to a review by Darren Naish. Darren has done a fair bit of research on pterosaurs and Mesozoic birds. He also spends a good amount of his time writing for the general public with several good books out. The reason I am saying this is to make it clear that his opinion on this book is far more important and knowledgeable than mine. 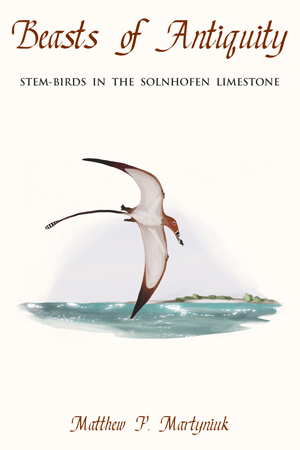 Matthew P. Martyniuk’s Beasts of Antiquity: Stem-Birds in the Solnhofen Limestone is a book on the pterosaurs, archaeopterygians, and a dinosaur that, as the name suggests, have been found in the Solnhofen Limestone. This formation is well known because one of the most famous fossils of all time was found there, that being Archaeopteryx, a fossil that has been used to clearly demonstrate the link between dinosaurs and birds. If this sort of book is interesting to you, read Naish’s review. Aliki Brandenberg, known mostly simply as Aliki, has written several popular books for children in the Let’s-Read-And-Find-Out Science series published by Harper Collins. Among these books are ones about fossils and dinosaurs written for 5 to 9-year -olds (I think 4-8 would be a better range, as many 4-year-olds will like the books and most nine-year-olds will have moved on to books with more information). When they came out in the 1980s, they were widely regarded as excellent books for children. The books were voluminously illustrated with colored pencil drawings of fossils and people studying them. The main text was supplemented with word balloons for the human characters, supplying interesting tidbits and additional information, so should not be ignored. Unlike many books of the time, these were about as accurate as one could expect to get without going into so much detail that a person of that reading level would feel overwhelmed.But it has been 25 years or more since then. We’ve learned a lot since then. How have they held up? Surprisingly well, for the most part, better than the majority of books published at the same time. I will review four of them here, two in this post and two in a following post. Some people might find the reviews a bit lengthy, so here they are in a nutshell: still good reads for kids, even better with a few additional comments to update them and correct a few misconceptions that kids might get from the simplicity needed to pare down complicated subjects into something that would fit the space constraints and interest levels. Publication Date: 1972, revised 1990. Fossils Tell of Long Ago endeavors to explain what fossils are, how they form, and what they can tell us. 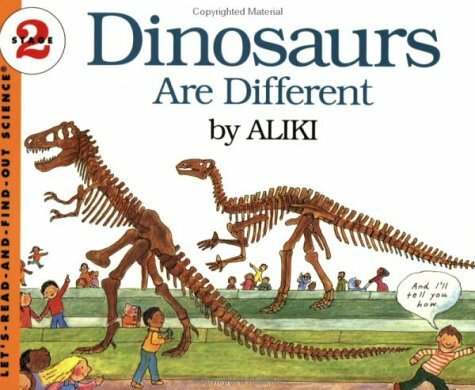 In a quick 32 pages, Aliki provides a wealth of information well written for the intended reading level of early elementary kids. Fossils starts off describing what fossils are and how they are formed. The description of the fossilization process is simplistic and doesn’t get into the microbes precipitating minerals around the bones during decomposition, but that was not known when the book was written and the description in the book is sufficiently accurate for the level of reader at which the book is aimed. I do like the use of the famous Xiphactinus fossil as the lead example as it is a fascinating fossil in its own right and thus a good fossil with which to hook readers. Aliki’s description of coal as a fossil is great. She does a good job of introducing different types of fossils, even including different pieces of information that may be gleaned from fossil footprints. Aliki then goes on to talk about mammoths in ice, amber, and how fossils can tell us about the environments when the rocks were deposited, introducing many more types of fossils along the way. She ends the section by reinforcing the utility of fossils to tell us about past environments and organisms that no longer exist, even putting in a plug for museums. The book ends with showing how to make your own fossil track and thoughts about how people in the future may interpret it. Best of all, she ends on a positive, encouraging note that anyone can find fossils, even the kid reading the book, and discover something no one else in the world knows. And that is a powerful motivator. All in all, the Fossils book stands up very well and can still be recommended as a great book for kids. Publication Date: 1988 (Amazon lists the publication date as 1990, which differs from what is printed in the book). Harper Collins Publishers, ISBN: 978-0-06-445077-5. “Dinosaur Bones” tells about the early history of the study of dinosaurs and briefly discusses dinosaurs and the world of the Mesozoic. This book does not hold up quite as well as the “Fossils” book and shows its age by being out-of-date in some places, but is still reasonably accurate a good read for young kids. It provides an interesting glimpse at the beginnings of the modern studies of dinosaurs (dinosaur bones have been found for millenia, but modern scientific study is much more recent) and a very brief introduction to dinosaurs and their world. This book, like almost every other book, has a European bias. On the very first page, it says the Dr. Robert Plot was the first person to describe a dinosaur bone in 1676. He had no idea what it was and he described it as possibly a giant human thigh bone or some other such animal. He was hardly the first to find dinosaur fossils and try to describe them though. Native Americans, ancient Greeks, and many others found them far earlier. They just did not recognize them as dinosaurs. Fossil Legends of the First Americans and The First Fossil Hunters:Paleontology in Greek and Roman Times, both by Adrienne Mayor, are filled with accounts of early fossil hunters. 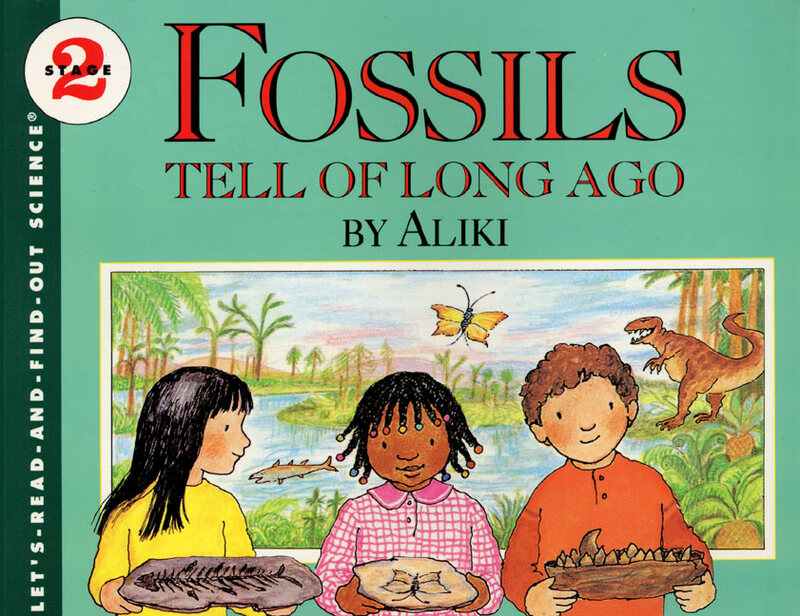 The book begins by describing how she was introduced to dinosaurs and her curiosity about how scientists know what we do about past life, which she begins to answer by talking about people finding fossils. The book provides an excellent short history of the early scientific study of dinosaurs by Europeans, hitting all the famous highlights. The best part of this section is her emphasis on early ideas changing with new fossils and new data. She presents dinosaur paleontology as a dynamic process, with ideas being revisited and revised in the face of new evidence, which is a great thing to put into a book for kids. The book then delves into the world of the dinosaurs, showing that the world was much different than it is today. I like that this was included and I realize there were space limitations, but I have a small problem with this section. 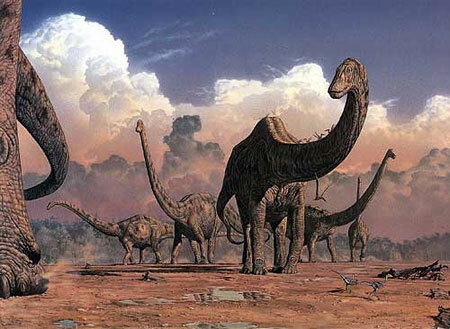 The Mesozoic Era, what is commonly known as the time of the dinosaurs, lasted for over 200 million years. That is a huge time. In general, the description of the continents being joined together into one land mass was accurate for a good bit of that time, but it broke up during the Mesozoic,which had important effects on the evolution of the dinosaurs. The temperatures were also only warm everywhere, as stated in the book, if one considered temperatures warmer than current “warm.” Neither the Arctic nor Antarctic were covered in glaciers, but it was still cold enough to snow and reach frigid temperatures at night in the poles. Basically, it is not possible to compress the diversity of climate and landforms of 200 million years across the entire world into two pages and six sentences. But given that constraint, she did the best that could be done. At the very least, she presented the concept of great changes in the globe over great expanses of time, which is a substantial achievement for a book aimed at elementary kids. Too complicated for a book meant for young kids, but shows why not indicating there are other ways to tell time is misleading. Talkorigins.org. Following this section are two pages describing how fossils are formed and geologic time. She mentions the important concept of dinosaurs evolving. For the space available and the intended audience, the book does remarkably well. For the purpose of just introducing the concepts to kids, they are handled succinctly and clearly. The biggest place where it falls down is saying that scientists tell time by looking at the order of the fossils. This is indeed one way, but if that were the ONLY way, it would be a circular argument. You can’t use the fossils to date the rocks and the rocks to date the fossils at the same time without additional evidence. This method also only provides relative dating, there is no way to really tell how old the rocks and fossils are this way, only the order they were laid down. There are some rocks though, such as ancient lava flows or ash beds, for which we can get absolute dates using radiometric techniques. Between the two dating methods and comparing rock units from different areas to each other, we can get reliable dates for all the rock layers. Having said that, the major geologic time units were devised by looking at the order of fossils. It was only later that we learned how to provide the absolute dates, which told us how old the rocks really were. I would have preferred a simple change of wording to say that finding fossils is ONE of the methods scientists use to tell time and not make it look like it is the only way. The change may not look like much, but it really does make a big difference and many kids will pick up on the distinction so long as adults don’t give them misinformation. The final few pages describe the history of the dinosaurs in a few sentences. The Triassic Period is done well for the allotted three sentences and the illustrations provide examples of some of the dinosaurs. The only problem here is the description of Heterodontosaurus, which is out of date (for cool information on this unusual animal, go here and here… no, really, check it out). 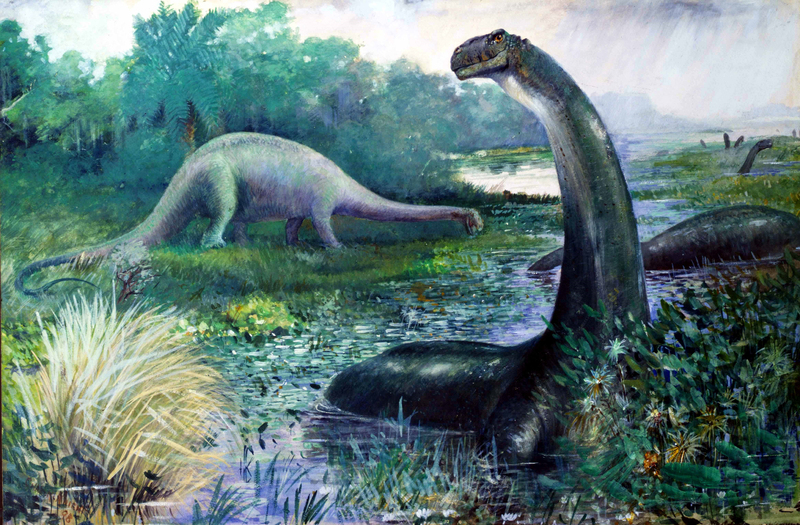 The Jurassic Period is a bit problematic in that it has the giant, long-necked sauropods tromping around what look to be swamps and dragging their tails, which is no longer considered accurate. Interstingly, all the carnivores are shown in dynamic, tails-up poses. The Cretaceous Period starts with saying “dinosaurs had taken over.” Dinosaurs were dominant throughout the Jurassic Period, long before the Cretaceous. 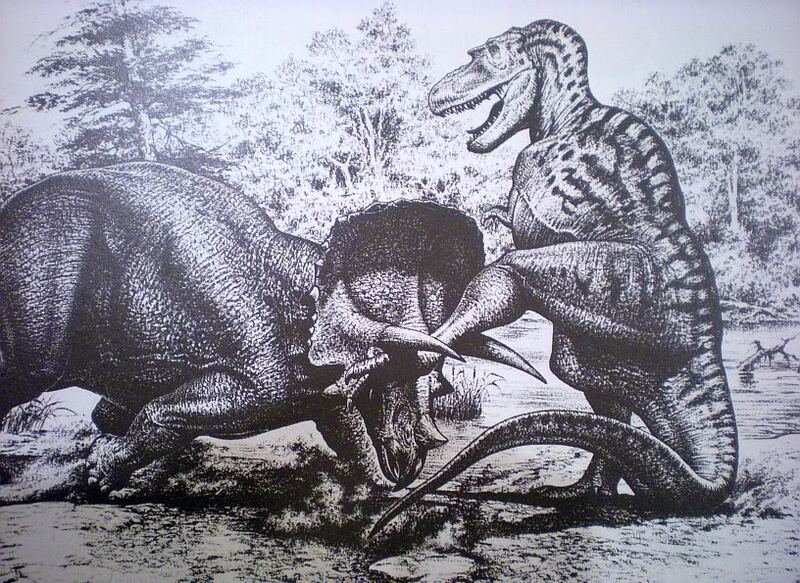 The dinosaurs are also drawn too much in the old, upright positions. More than any other page, this one looks like a throwback to an earlier artistic era. In the entire section, the dinosaurs are drawn very simply and generically, despite the fact that they are named with specific names. The final page starts with “Then suddenly, they all died out. No one knows why.” This is followed by several things scientists don’t know about dinosaurs. By and large, it is true, but we have made great progress and can now provide at least partial answers to all of them now. We now have some very good ideas about why they died out. There is also considerable debate about how “suddenly” it was. Most notably, dinosaurs didn’t all die out, just most of them. Birds are directly descended from the Mesozoic dinosaurs and are the most diverse group of vertebrates that live on land. Scientists are also making strides to answer the final questions the book states about their colors, what sounds they made, and their metabolism. While there are still many gaps, we have made much progress on those questions. As a result, I would recommend that anyone reading this book to kids mention how old the book is and that a lot of work has been done since then to find answers to those questions, but there is still much more to do. Not ALL dinosaurs died out. 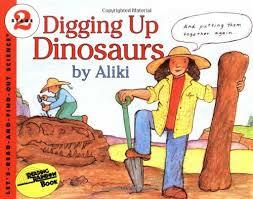 Next time, I will review Digging Up Dinosaurs and Dinosaurs are Different. When my kids were in preschool, I read them Digging Up Dinosaurs several times. Stay tuned. Barrons Educational Series, Inc. ISBN: 978-0-7641-6378-4. 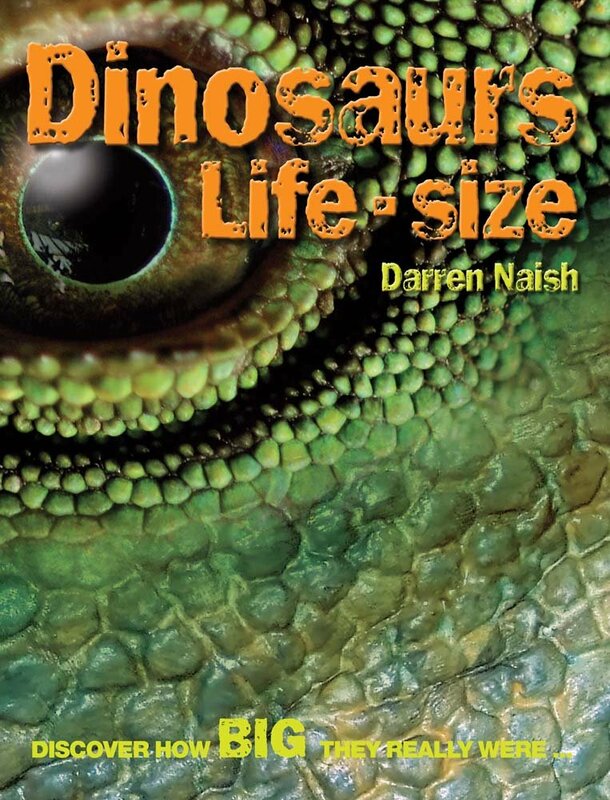 Author: Darren Naish is a well respected paleontologist publishing on all manner of dinosaurs, marine reptiles, pterosaurs, and other extinct animals. While he has published several notable scientific papers, he has also written extensively for the general public, ranging from children’s books to books for the educated layperson. In addition to this book, Naish published Dinosaur Record Breakers, another good book that kids will find interesting. He has also published on cryptozoology, the mostly pseudoscience study of “hidden” creatures, such as Bigfoot and the Loch Ness monster, debunking a variety of mythical creatures and discussing more plausible alternatives. You can also always find him at his highly regarded and widely read blog, Tetrapod Zoology, on the American Scientific blog network. Dinosaurs Life Size came out a few years ago, but it is still a decent book for kids. I can’t say good for reasons discussed below, but it is better than many and has mostly good information. Don’t get it confused with the book of the same name by David Bergen, which came out in 2004. Naish’s book is much more up-to-date and scientifically accurate, having the advantage of having been written by an active researcher in the field who knows what he’s talking about. Not to criticize Bergen’s book as I haven’t read it, but if you were going to choose a book that was a decade old written by a non-expert or a book a few years old written by an expert who also happened to be a professional writer, which would you choose? The book begins with a short introduction to dinosaurs and the book. A fold-out timeline follows, which puts all the animals discussed in the book in its appropriate place in time. The timeline includes a brief description of each period within the Mesozoic Era, commonly known as the Age of Dinosaurs. The meat of the book is a generally two page description of 26 different animals. Each animal gets a brief discussion of what it looked like, where it lived, and a few interesting factoids that have been pulled “from the bones” as a section for each animal is called. Of course, the main draw of the book are the size comparisons. These are handled in two ways. Each animal is illustrated in full view alongside a young kid for scale. Almost all of them also have a drawing of a body part in real size, which really puts into glaring contrast just how big (and tiny) some of these animals were. Herrerosaurus has a hand, Lesothosaurus has its head for scale. At the extreme ends, Sauroposiedon has an eye and Argentinosaurus has a toe while Microraptor and Archaeopteryx are small enough to be drawn in their full glory. Most are covered in two facing pages, so that every turn of the page presents a new animal. A few are presented on fold-out pages, although I am unclear as to why because only one actually takes advantage of the extra space to present its animal. the other one just puts two animals instead of the standard one. After the animal descriptions is a fold-out page with a dinosaur quiz to test the reader on what they learned. this is followed by a short discussion of what fossils are, how they are formed, how old they can be, how they are found, and a couple of famous fossil examples. The book ends with a glossary and index. All told, there is plenty of solid information for the young reader who will gaze in wonder at the dinosaurs and at least some will enjoy testing themselves on the quiz. The book has good information. I particularly like the pictures of a globe marking where each one is found. The illustrations of the life size bits give a good indication of the actual size of the animal. I like the pictures of real fossils and the bits of information about what has been found through their study. The book is very visual and should appeal to kids. The book is listed as being most appropriate for kids in grades 2-6, which I think is a pretty fair assessment. Advanced readers in first and second grade will like it, but will be bored by it by the time they get out of elementary school, but most kids in the 3-5 grades will like the book. There are only SIX dinosaurs here! I do, unfortunately have some serious complaints about the book. First and foremost, the book is called “Dinosaurs Life Size”. I would prefer books labeled as such stick with dinosaurs. Despite knowing better, Naish chose to include descriptions of Plesiosaurus, Stenopterygius, Liopleurodon, Pterodactylus, and Quetzalcoatlus; none of which happen to be dinosaurs. You may notice that this leaves only 21 actual dinosaurs. A better title would have been Mesozoic Reptiles Life Size, but I can understand that probably wouldn’t sell as well. Still, it is misleading. What I cannot forgive though, is that he does NOT clearly identify them as non-dinosaurs. This is such an unforgivable sin that I am tempted to tell people not to get this book. The only place he indicates they are not dinosaurs is ONE sentence in the introduction. Naish has published research on all of these animals, he certainly knows better, so this is unpardonable. The next complaint I have is in the illustrations themselves. Some of the dinosaurs are noticeably absent of feathers. The Gallimimus is bare, except for a tuft at the top of its head. Part of this an be forgiven by the enormous advances that have been made due to new discoveries in the few short years since publication of the book. 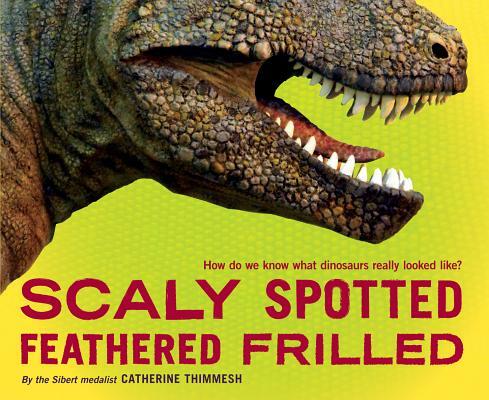 But even in 2010, we knew more dinosaurs were covered in feathers much more than is shown in this book. 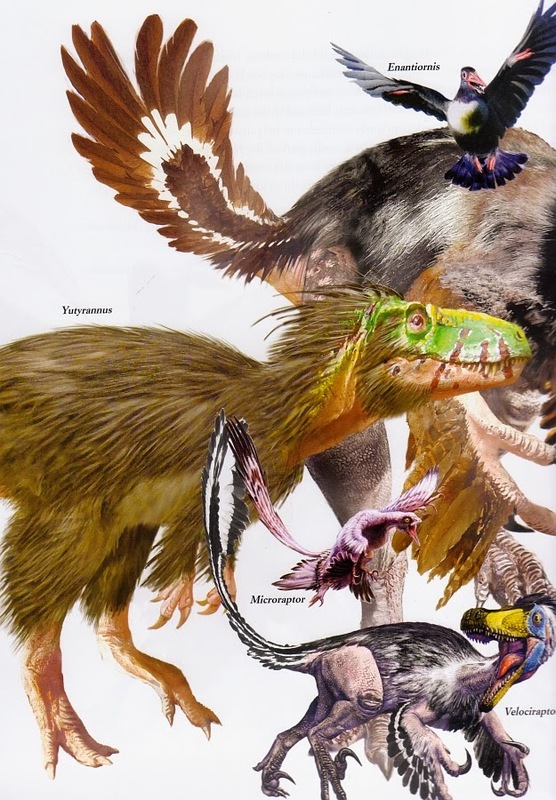 It is possible that feathers of some sort were an ancestral condition of ALL dinosaurs, so the bareness of some of these illustrations is wrong, even for the information he had at the time, so why the drawings were done this way is beyond me. 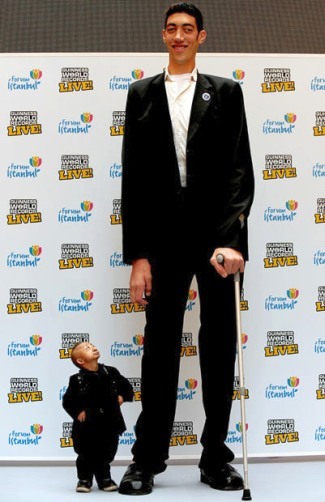 The average human height is 5′ 6.5″. Yes, that’s descriptive of the species. The last complaint I have is in the sizes. Each description is given a word description of how big each animal is. But the pictorial comparisons with the children are not the best. There is only a rough idea of how big the children are, which one is forced to base entirely on one’s experience with kids as there are no scale bars in any of the pictures. For a book about size, this is an inexcusable oversight. I have personally seen kids of a similar age who were between three feet and five feet. Now imagine extrapolating that difference to an animal that is thirty times that size and you can see the immense errors involved. 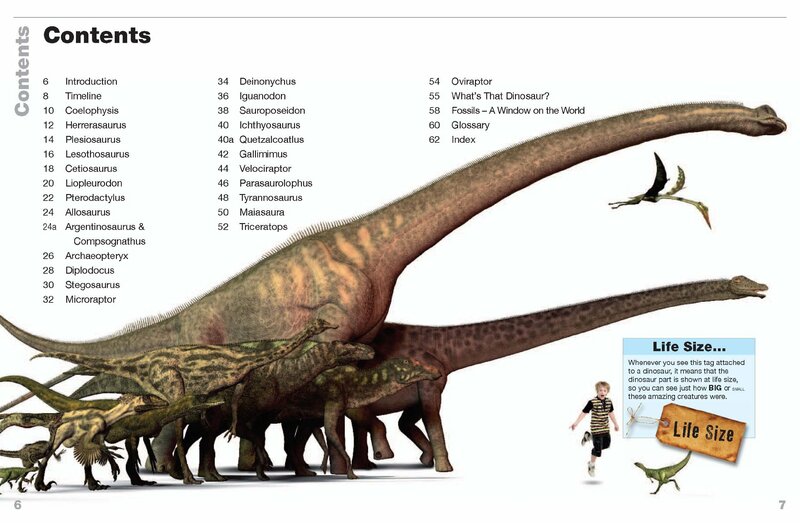 Admittedly, there is a lot of uncertainty in the actual sizes of many of these animals (there are pretty much no complete sauropod tails, for instance, so determining length is problematic). But this book neither mentions anything about the uncertainties involved and then complicates the issue with further uncertainties in the illustrations while giving exact measurements in the written description. So, in conclusion, I cannot fully support this book as there are too many serious problems. However, it is still better than many others on the market and does have solid information in the texts. The pictures give a rough idea of sizes, which for the age the book is geared towards is reasonable. But it is inconsistent with the sizes between the text and the illustrations; the illustrations themselves are not always accurate in terms of what we know about feather coverings, thus showing somewhat antiquated pictures of dinosaurs; and the book is really about Mesozoic reptiles, not dinosaurs anyway. Thus, the best I can do is give it maybe 3/5 stars, which pains me deeply because Darren Naish is a truly smart, well-read, and knowledgeable person who otherwise has written lots of great material. Publication date (2nd ed. ): 2013 according to publisher (my copy says 2014), 452 pg. Roberts and Company Publishers. ISBN: 978-1-936221-44-8. Author: Carl Zimmer is one of the best science writers in the business. You can keep up with him on his blog, which is part of the National Geographic “science salon” called Phenomena, a collection blogs by Carl Zimmer, Brian Switek, Ed Yong, Virginia Hughes, and Nadia Drake, all of whom are experienced science writers with a talent for accuracy and clarity. They cover everything from dinosaurs to DNA to dark matter and are the first place I go to in the morning for interesting science news. If it sounds like I am selling them, I am in order to convince you that a book by Carl Zimmer is both more accurate than the current textbook you are using and better written. Zimmer and the others are not just authorial guns for hire, they care about science communication and they do it well. My first introduction to Carl Zimmer was a book called “Parasite Rex“. You probably are thinking that a book about parasites would not be the most interesting of books, but you would be wrong. Read it and it will open up a whole new (albiet disturbing) world for you. The name of the book is derived from the opening line of the last paragraph in The Origin of Species, by Charles Darwin, a fitting name for a book introducing evolutionary topics. While I have a few complaints, none are major and I highly recommend the book. My chief complaints are that I always want more, but there is only so much one can put into a book, especially an introductory text. The book is filled with high quality pictures and graphs that break up the text, but whereas many books have flashy graphics that serve little purpose other than to distract from the text, all the figures in the book clearly relate to the topic at hand without excessively cluttering up the book. They also provide data that get the reader to go beyond the “because I told you” format so many books use and actually look at some of the data supporting the scientific concepts (and serve as a great way to integrate math, geography, and art standards into the science). Each chapter also have a list of resources for further reading and an extensive bibliography, so anyone can check the data presented in the primary and peer-reviewed literature for themselves. One thing that might make some teachers and students a little annoyed is that important terms are not in bold font, nor does it have problem sets. However, it explains all the terms as they come up, it does not require flipping to the end of the book for every new term, although there is also a glossary for those that need it. The book is designed to be read, not just skimmed through while one picks out the bold words, like so often happens. However, there is also a study guide for the book written by Dr. Alison Perkins, which includes all the learning objectives, questions, activities, and pedagogical suggestions that teachers are looking for. The book begins with a detailed discussion of whale evolution as an example to introduce several general concepts of evolution and various ways in which evolution may be studied. It covers fossils, placing them into phylogenetic and geologic context, DNA studies, embryology, and ecology from their earliest beginnings to today. Zimmer doesn’t go into the disputes that arose about whale origins, instead just focusing on what has become the consensual understanding, which I find a bit disappointing, but perfectly understandable for the context of this book and especially this introductory chapter. Nevertheless, I like presenting disputes because it shows the dynamic nature of science as an exploration, not just a book of facts. He presents the exploration through a discussion of the fossils being discovered and how they were interpreted, he just cleans up the historical path and makes it neater than it really was. Chapter 2 brings a history of evolutionary thought, starting in the 1600s and the development of evolutionary concepts before Darwin. Zimmer correctly explains that Darwin was not the first to conclude that organisms evolved, but he did provide a plausible mechanism for how it happened. He then continues with a discussion of the changes and additions to evolutionary theory in the decades since Darwin. He tackles the important misconceptions of evolution, including the common misunderstanding of what a scientific theory really means, which form the basis of most people’s arguments against evolution. Chapter 3 presents geological data, including how radioactive decay is used to date rocks and biomarkers to detect traces of life within rocks. He tells us how fossils tell us about the past, followed by a brief overview of the major transitions in life from the dawn of life to today. 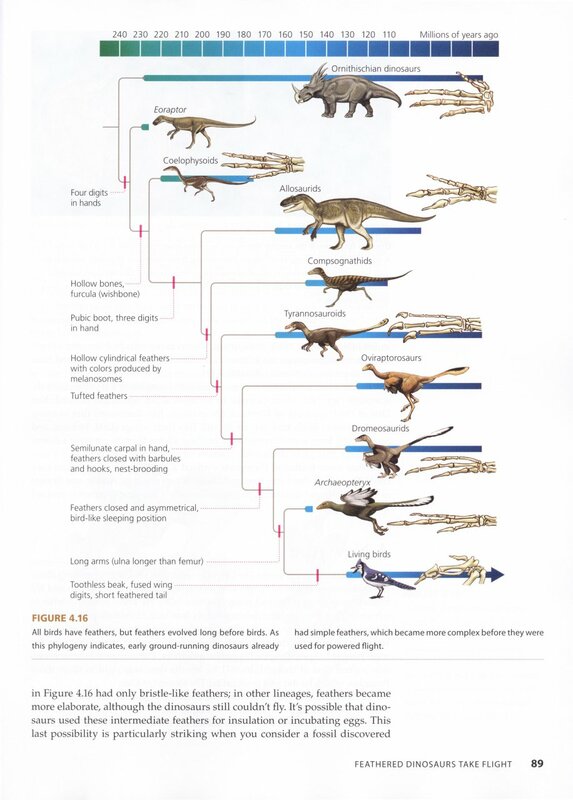 One of the many phylogenetic trees in the book showing the evolution of, in this case, birds from dinosaurs. Chapter 4 is probably one of the most important chapters that is left out of many introductory biology texts. Zimmer tells us what phylogeny is and how to read a phylogenetic tree to understand evolutionary relationships. It is particularly disturbing so many books skip this step because it is vital to understanding much of what comes after. Misunderstandings here reverberate throughout one’s ability to understand evolutionary theory, yet reading phylogenetic trees is not as intuitive as most teachers think. He talks about homology and how that affects our understanding of evolution. After he introduces the concepts, he demonstrates the concepts through a series of phylogenetic trees, such as early mammals, dinosaurs, and hominids. Chapter 5 talks about DNA and how variation is introduced. Zimmer does a great job of discussing the various types of mutations and showing the typical view of point mutations is but the smallest way of introducing variation. His discussion of the role of sexual selection in creating diversity is short, although his description of Mendel’s experiment with peas helps somewhat. He also gives short shrift to lateral (aka horizontal) gene transfer, in which genes are transferred not through descendants but sometimes through completely unrelated organisms by, for instance, viruses. Zimmer also completely ignores endosymbiosis, which helped create mitochondria and chloroplasts, and hybridization, which makes this chapter not as satisfying for me. Chapter 6 covers the role of genetic drift and selection well, although he leaves out a discussion of gene flow from one population to another. I like that he talks about fitness in terms of more than one gene, showing that what may be good for one gene is not necessarily good for another in terms of fitness, so that evolution is limited by the interplay between genes that each have their own optimal conditions. This would have been a good place to address the misunderstanding of “survival of the fittest,” which is commonly viewed as a tautology (the fittest survive, but how do you determine who is fittest? The ones that survive) but he does not mention it. This is a very common misconception. First, the phrase was never used by Darwin and is incorrectly and second, it is being incorrectly interpreted. It is not the overall fitness of a particular organism that matters, but a measure of how many offspring successfully survive and reproduce. It doesn’t matter evolutionarily if you are the toughest guy on the block if you don’t breed and produce successful offspring. Chapter 7 discusses molecular phylogenies, figuring out evolutionary relationships from their DNA or protein sequences. One complaint I have here is that he talks about how successful the molecular clock is, how you can tell time using the amount of mutations separating species. In all actuality, the molecular clock has some serious issues, as in, it doesn’t work very well. Fortunately, he does discuss some of the challenges of the molecular clock (genes don’t mutate at the same rate either between each other or within different parts of the same gene, or through time, it requires fossils to calibrate and then tries to claim better results than the fossil data, etc.). The problems with the molecular clock mean that its usefulness and accuracy are limited and requires statistical manipulation of the data to try to take into account the known issues. Unfortunately, the figures lead one to believe the molecular clock actually acts clock-like, reducing the impact of the text describing its problems and the examples in the text downplay the problems. A bonus to this chapter is that he brings back the topic of horizontal gene transfer and shows its importance in a box at the end of the chapter. I might have put this in the last chapter and discussed it more, but it could be that Zimmer thought it might confuse people by introducing too much complexity at once and wanted the readers to develop a bit more understanding before throwing another wrench in the works. Chapter 8 gives a great discussion of adaptation, taking it from the gene to species evolution. I particularly like his discussions showing how gene duplications and rewiring without the need for further point mutations can make huge differences. This is a really important concept to understand, that variation is more than just the single point mutations most people think about. He ends the chapter with a discussion of the limits of evolution based on physical limits and baggage from previous evolutionary steps, although I would have liked to see a brief mention at least of the constraints imposed by having genes with different optimal conditions that all have to be balanced. Remember when I said chapter 5 gave short shrift to variation through sexual reproduction? That is because chapter 9 is completely devoted to the topic. Here he goes into several aspects of sexual selection, including trade-offs that may limit evolution in any one particular direction. Trade-offs in this case refer to the fact that improving one thing takes away from another. The genes with different optimal conditions are an example of this. Improve and you hurt another until a balance is achieved. Formation of the Chicxulub crater formed at the end of the Cretaceous. Chapter 10 defines what a species is (which is nowhere near as easy as it sounds) and how species evolve into other species. Chapter 11 extends that to evolution on a grand scale, showing the development of global biodiversity through time. I would have preferred to see a discussion of the difficulties in determining fossil biodiversity, such as the relationship between the amount of outcrops of a particular time and the number of species known, but there is only so much one can put into a textbook. Inevitably, the chapter discusses the major extinctions of the world, although he only talks about two of them, the Permo-Triassic and the Cretaceous-Paleocene extinctions, probably because they are better known by far than the others. His discussion of the Permian extinction doesn’t mention that the reason the volcanoes at the time put out so much carbon dioxide was that they apparently burned through huge coal deposits, which pumped up the carbon dioxide way beyond what the volcanoes would have done alone, but he gets the gist of the cause of the extinction. He also discusses briefly the debate in why the extinction occurred at the end of the Cretaceous, which is good. The chapter ends with a discussion of the current mass extinction taking place and the causes for it. Chapter 12 discusses coevolution, both mutualistic and antagonistic. Here Zimmer finally discusses endosymbiosis and the important role it played in evolutionary history. Chapter 13 is an interesting discussion about the evolution of behavior in both plants and animals. Chapter 14 will of course be the most controversial chapter because it deals with human evolution. Zimmer does a good job with this chapter, although I would have preferred a clearer statement that hominids and apes both evolved from a common ancestor, but where our ancestors became adapted for savanna life, the apes evolved more towards forest life. He talks about the interbreeding that happened between neanderthals and Homo sapiens, as well as with the Denivans, according to the genetic research published recently, which will make a few people uncomfortable, but is the truth nevertheless. The chapter wraps up with a discussion of some evolutionary psychology, which is highly controversial, but the parts he discusses are well supported by experimental evidence. Publication date: 2013. 61 pg. Golden Books, Randomhouse. ISBN: 978-0-375-96679-8. Do these books look familiar? One is the classic book that most people old enough to be parents grew up on, first published in 1960 and continuing through 1981. 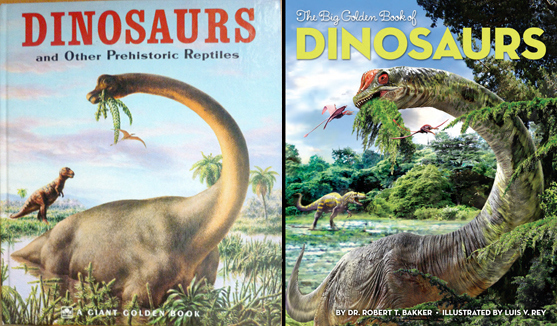 The second is the new, Big Golden Book of Dinosaurs, a new, totally updated edition that came out in 2013. The book is written by Dr. Robert Bakker, known by many as the bushy-bearded, cowboy hat-wearing paleontologist of many documentaries and the author of such books as the Dinosaur Heresies and Raptor Red. Illustrations are by Luis Rey, a talented artist already mentioned here due to his work illustrating Dr. Holtz’s Dinosaurs book. Dr.Holtz’s book was written for a wide audience, geared towards children of middle school age and upwards. This book, like its predecessor, is geared for elementary kids. So it is not as detailed, but it is even more lavishly illustrated and will definitely hold the interest of younger kids. From the front cover to the last page, those who know and love the original book, will find it echoed here, but updated with the latest information. inside the front cover is a map of the world as it existed in the Triassic and early Jurassic, with dinosaurs dotting the landscape, showing where various dinosaurs have been found. The map is matched on the inside of the back cover with a Cretaceous map. Both maps have the names of each of the dinosaurs illustrated so you know what you are looking at. There is also an index and handy pronunciation guide for all the animal names. While the book is of course heavily weighted towards dinosaurs, like the previous book, it does not focus entirely upon them. In the brief introduction, it makes a point to place the dinosaurs in context as part of an evolving ecosystem, not as isolated creatures. 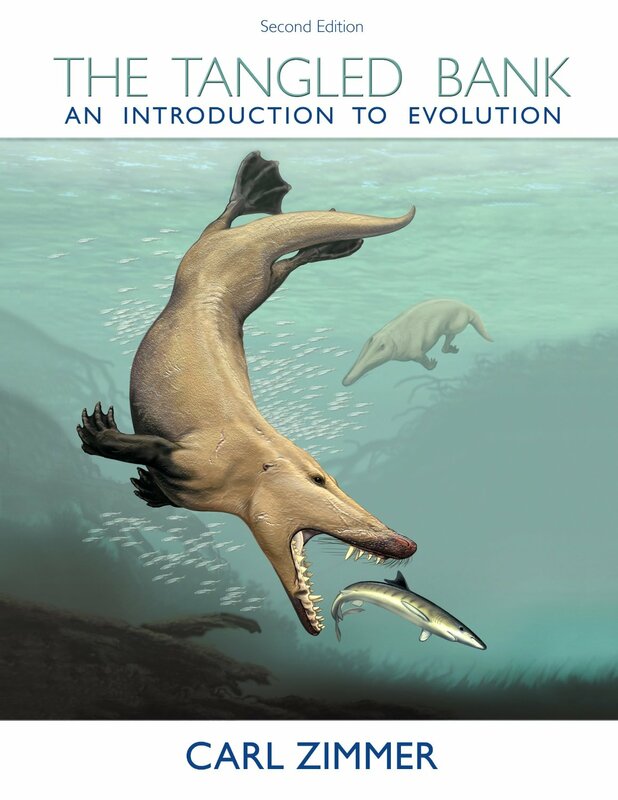 The book then dives into the Devonian seas,introducing us to the fish that began the walk towards becoming landlubbing tetrapods (animals with four legs). It continues with a few pages on the Carboniferous and Permian Periods, with giant insects, early amphibians and reptiles, and even animals like the iconic Dimetrodon, properly identifying its kin as ancestral to modern mammals, even explaining key features showing it’s related to us. Only then do we get to the Triassic, the beginning of the Age of Dinosaurs and even then, it starts the discussion with pterosaurs and the ancestors of crocodylians. After a mention of the earliest dinosaurs, it then mentions the proto-mammals. Finally, we reach the Jurassic Period and it is here that dinosaurs take center stage, with gigantic, long-necked sauropods and other well-known dinosaurs. Even so, they don’t forget the small, mouse-like early mammals under foot. After a brief interlude to discuss the great sea reptiles that appeared during this time, as well as the pterosaurs, that were now much bigger and diverse than in the Triassic, they return to a discussion of dinosaurs, this time focusing on a bit of history explaining how our views have changed over the decades. 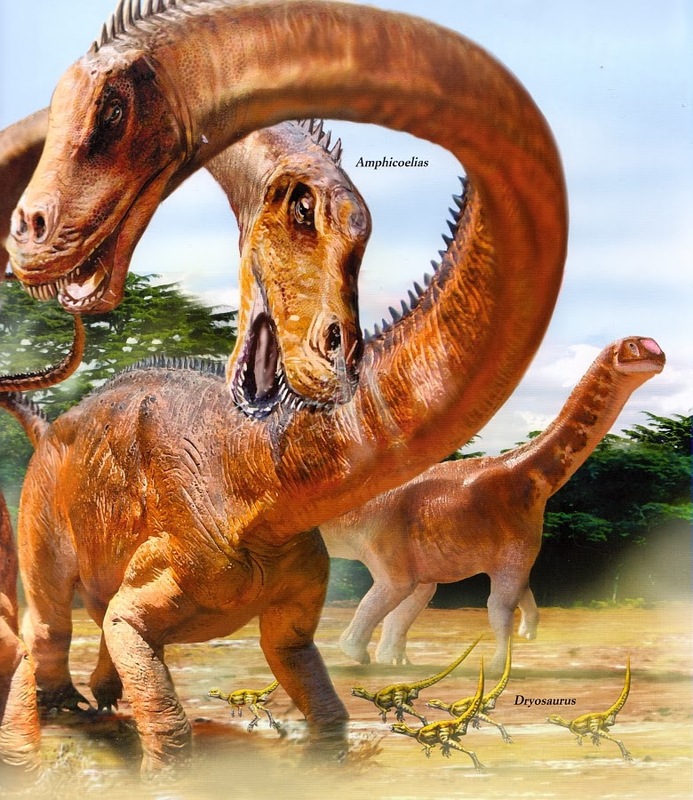 The book moves then into the Cretaceous, showing how dinosaurs adapted to diverse environments, such as the sand dunes of central Asia to the snows of the poles. There is a chapter on different ways dinosaurs communicated with each other, including singing, after a fashion, much like birds and animals call to each other today, although he goes a bit overboard in this area and speculates beyond what most in the field would say is reasonable. Of course, no elementary book would be complete without a chapter devoted to Tyrannosaurus rex and its battle with an armored herbivore, in this case, the ankylosaurid Euoplocephalus and a battle with Triceratops. 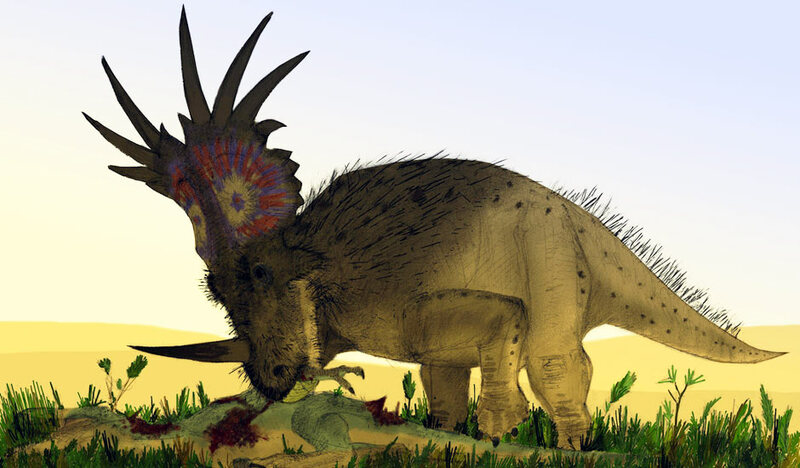 While the book makes much of the use of horns and frill by the Triceratops in battling T. rex, they were almost assuredly evolved to battle other Triceratops as dominance displays, like bison or antelope today, although that of course, doesn’t rule out their use as defensive weaponry against predators. There is the required chapter on dinosaur extinction and it does a good job of mentioning several possibilities. However, it gives a bit of short shrift to the most accepted asteroid hypothesis and a bit more space to Bakker’s favorite hypothesis of disease, which is almost assuredly not true as a hypothesis of widespread extinctions on such a large scale. To his credit, he ends with the likely possibility that no one hypothesis is sufficient for explaining everything. The book ends with what animals actually benefited from the extinction, that being mammals. 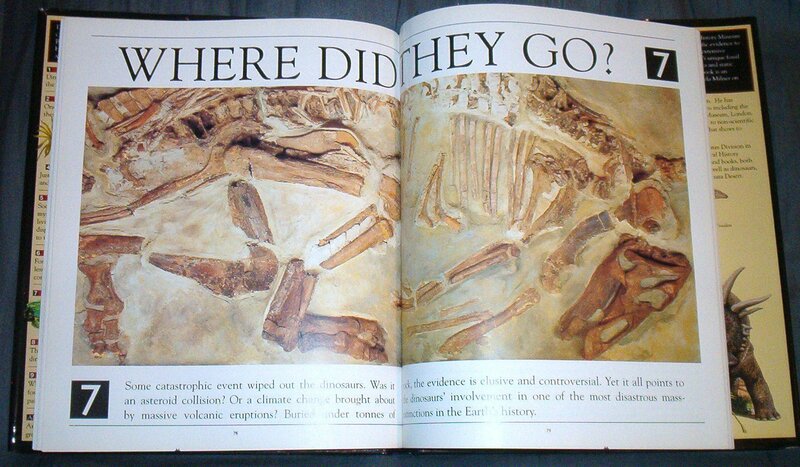 The book ends with noting that not all dinosaurs died out and acknowledging the influence that dinosaurs had on the evolution of early mammals, thereby connecting the story of the dinosaurs to us. Besides the great illustrations, that I think, is the key strength of this book, never letting the reader forget that dinosaurs were but a part (a big, incredibly impressive part) of a bigger ecosystem, with each piece influencing the others. No group was isolated from the others, all are interconnected. Overall, while I had a few minor quibbles, as i mentioned above, I can definitely recommend this book for any elementary library. Some middle school kids will like it too, although those older than that will likely be reading it for nostalgia of the original book, who will find this version a worthy successor. Other than the image of the 1960 book, all images are illustrations from the book.